w Has Marlon and movieland got a lot to answer for way back at the dawn of the bikie gangs ? Law and order is cracking down on the city Bikie Gangs and the minority who engage in unlawful activities and shootings. Can the police successfully take them on? 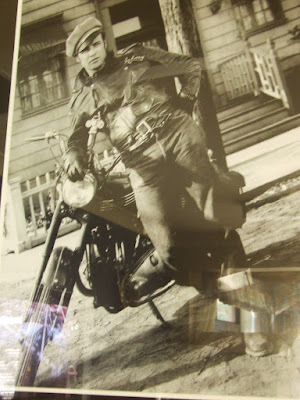 The Wild One, a film in which brooding Marlon led the Black Rebels Motorcycle Club, inspired generations of rebels who took to leathers and must have been very impressed by his 1950 Truimph Thunderbird GT, skinny tyres and all! This film gives an insight into techniques past. It was banned in the UK for a time. Not only that ...Johnney's (Brando) internal tension makes him an archetypal postmodern anti-hero...!! Fun and games are part of the nursing home lifestyle. Here I was, thinking these props must be instrumental in validation therapy or somesuch therapy. (The red-back spider in the picture is part of our folk-lore.) 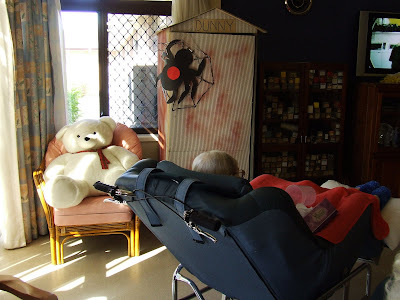 Even more surprising, the props were part of a wonderful 'ball' held for the residents and relatives and the staff. Whatever was the theme that night? 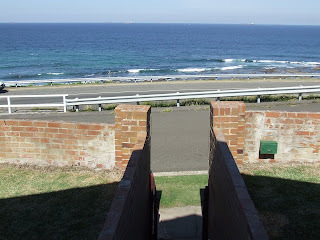 Newcastle East where views of Newcastle Beach can be had. Houses with a round tower are few and far between. The front, or is the rear view, has a VW Golf convertible which are also few and far between. 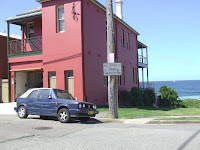 Scott Street almost reaches the sea shore at this point but is blocked off and a similar photo was posted here some weeks ago and showed a BMW that time (and alluded to the 'subtle' signpost on the narrow laneway). Two young women spreading infectious good cheer in John Hunter Hospital. 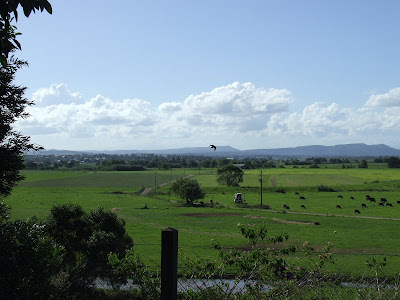 The Hunter River-Flats viewed from the township of Morpeth during a big day out. 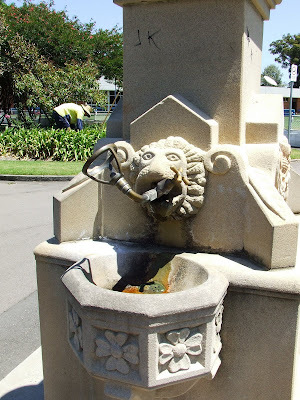 Today is World Water Day proclaimed by the UN (and reported in The Sun-Herald). Increasing demand for pure water in new markets countered any slight drop in bottled water consumption from a wet summer in Europe. 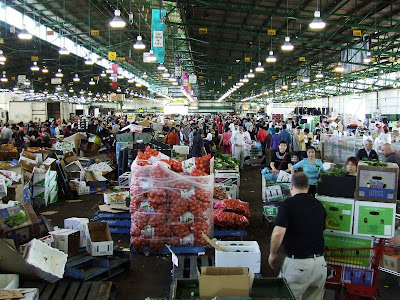 The report showed that consumption increased by 1.4 litres per person on 2006 figures, meaning that, globally we each consumed 30.8 litres in 2007. Australian consumers have been slower to embrace bottled water, but it has been one of the fastest growing drinks over the last 6 years. Aussies buy about 12 litres per person per year and this has grown by about 10% a year. However, we will take a few years to catch up with the Italians who consume 200 litres a year each. In spite of recent negative media reports, Zenith predicts bottled water consumption will rise a further 32% to 272 billion litres in 2012. Source! Australian Food News, Sep 16 2008 reported in Earth Garden no 146 Dec 2008-Feb 2009. 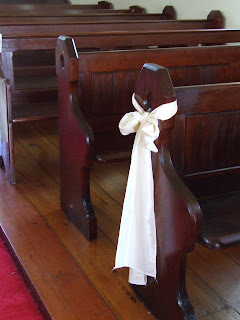 Everyone loves a Wedding and this romantic little rustic chapel makes the perfect setting. Outdoors, the trees and lawns merge with the lovely countryside and a path leads to an equally delightful venue for a reception and, in all, is a perfect backdrop for the photos. 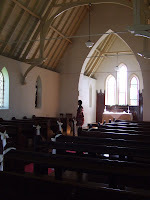 The church has no religious affiliations and is open to all approaches and has a dedicated manager on site to attend to all the details for that perfect day. 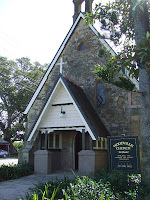 The location is Woodville beyond Maitland and the stone building dates from 1864. 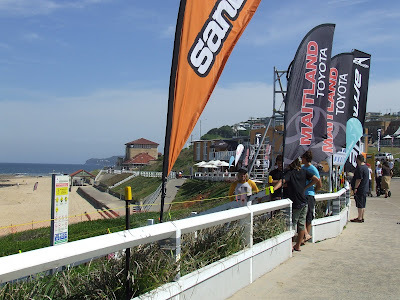 Surf Fest at Merewether Beach prior to the main action this weekend. Yesterday's photo was of a house on the hillside in the distance. 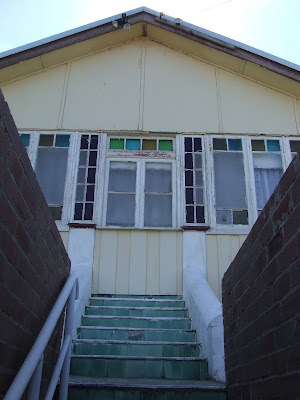 This old dwelling was in the one family (not mine) for years and sits, in its original condition, up above Merewether Beach. Imagine a cool southerly or a wonderful gale lashing the windows. 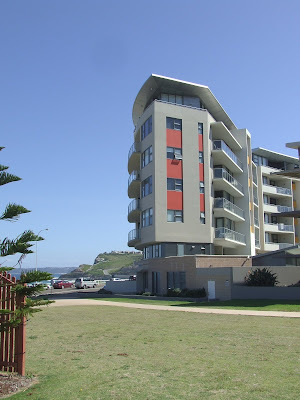 The property will be auctioned tomorrow. A boring wide road was built on the level below. 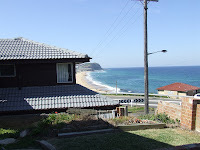 The house nextdoor now stands in the way of nice views. 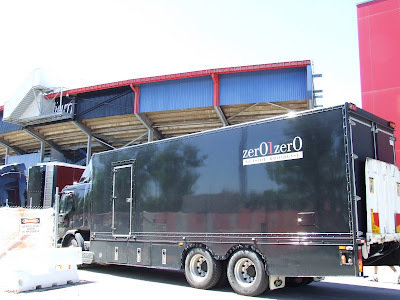 Here for the Asian Footballs Championships were two mysterous big rigs: zerOIzerO. At EA stadium to do outside broadcast of soccer for satellite TV probably. The local Jets defeated South Korea on Tuesday night. Parking was tight because the area is in transition and is a building site for a new stadium. 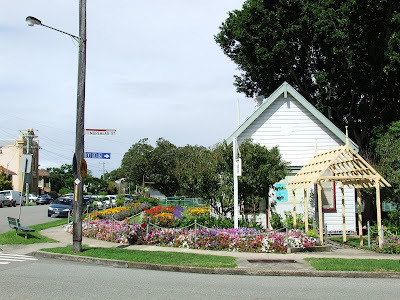 On a corner of the park in Lambton the citizens are blessed with flowers and with books in a branch of the City Library. 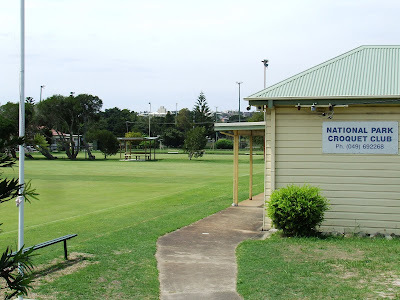 An inspiring photo at the Croquet Club, Newcastle. In the theme park, Dreamworld, Gold Coast, (South-Eastern Queensland) are these fine Sumatran tiger cubs, Shanti, Jaya and Ndari who were born last June as part of an international breeding program to save this critically endangered species. At Dreamworld's Tiger Island, the animals, including elegant gold and white Bengal Tigers, play and interact with their handlers in activities that are designed to raise money to finance their care and to save the species. Two recent reports of the Sumatran tiger tell of their cruel attack on the farmers. Wonderful Jungle habitat is lost in Sumatera and land clearing is unstoppable and the Indonesian government is not helping. Of course, our country is no example either when it comes to land clearing. 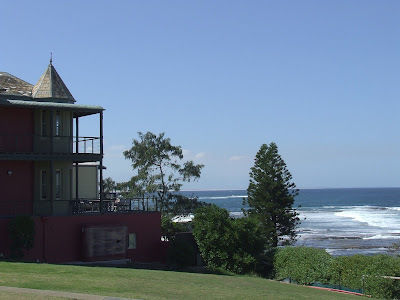 And at present, 60km of coastline, north of Brisbane, is in crisis from an oil spill. A ship's fuel tank was ruptured in a storm. 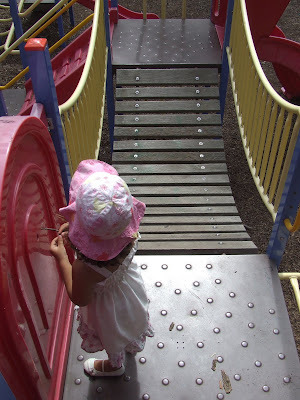 School playground one day, market day the next. 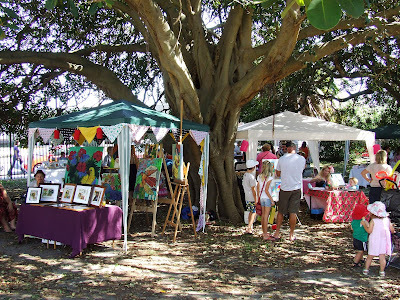 The Junction Public School has begun a market on Saturday mornings, once a month, I believe. The school was known as the Junction Demonstration School but was not one for political activists; the Teachers' College was once nearby. Here is Tyrrell Street, one of several city streets where the tree canopy meets overhead and encloses a grande space underneath. The trees are getting old and a number have been found to be unsafe and their future is under review. Removal is quite a task and the lower end of the street was "clean felled" and new trees were planted. The change from what we knew continues to give a jolt. 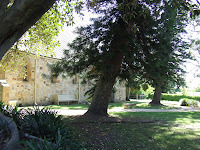 The City Council Greening Centre, Kotara and the joy of shade. 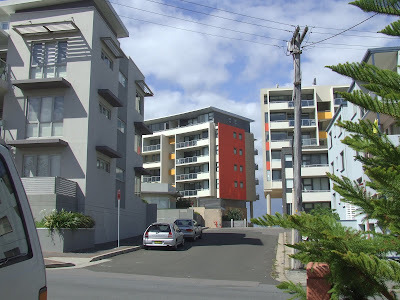 In summer-time people look for shade and motorists often park their car under a shade tree and a tree-lined street with vacant parking spaces becomes a sight that fills one with joy. I'd like more shade trees in our street because of their benefits and to park the car under and after resolving to do this for a long time, finally struck a blow in that direction by visiting the City Council Greening Centre. It was suggested that a resident phone the council HQ first to find out what trees are most suitable. I must get on with it.... one day. Ho hum. Last week there was a strange occurrence when a rainstorm left brown muddy spots and marks all over our cars. Dust had been carried in the air from the inland regions or some say it came from the burnt-out lands in the south and created special effects on dark coloured cars. So, now, the roof-top solar panels are very grimy and dusty and are not peforming really well. They need a wash! 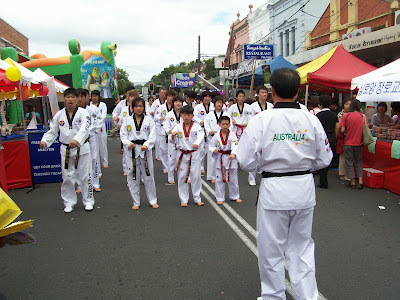 South Koreans in Australian. As well as mask dances Korean folk dances include drum dances (sungmu) full of action and skill. In this version the drummers marched to the stage to form a rank of drummers to entertain the crowd. South Korea. Day trips were popular with Koreans when they went walking in the National Parks or to remote old Buddhist shrines which had extensive woods and prayer halls and a wealth of sculptures, images and hand crafted works to surprise the visitor. The monk's clothing was distinctive particularly in another style in grey worn too by the women who also adopted baldness. On a rocky hill-top a group of Buddhist monks asked for a photo with a tourist. T'aekwondo is a martial art form and is a Korean tradition with followers found everywhere. 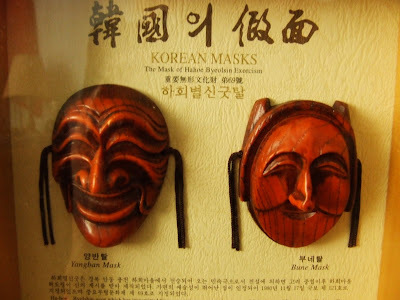 Korean Masks of Hahoe Bycolsin Exorcism (in minature form). It is believed these masks are used in a folk drama from the Fourteenth century and have been transmitted from generation to generation and because of their aesethic value and artistic quality have been declared a National Cultural Asset. 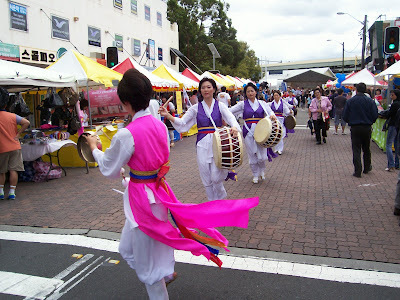 Religious and court dances have been among the Korean traditions. In other instances, behind the masks, the ordinary people poke fun at the ruling class or gesture in mock imitation of the Buddhist monks and of the aristocratic gentlement and others. A shaman kut (exorcism) is performed before a mask play begins. I suppose these days the main exponents would be from select groups of performers as traditions give way to modern life. 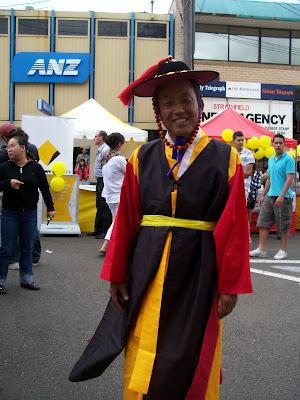 Traditional Korean clothing, called hanbok, worn here for a special occasion. Welcome to President Lee Myung-Bak of the Land of Morning Calm (South Korea) who is visiting this country accompanied by other Korean VIPs. He has paid tribute to Australians who fought is the Korean War of 1950 to 1953. Korean art in the traditional style. This Canadian tourist said she loves Newcastle. 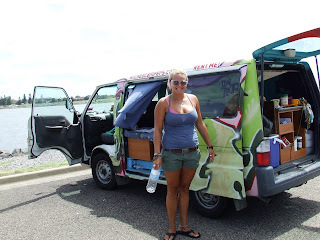 With a friend, she is travelling from Cairns to Adelaide, about 2800 kilometres. 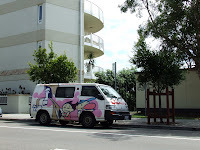 Another Wicked Camper message: "Love might be blind but marriage is a real eye opener"
At Nobbys Beach: Aquarius stuff plus "I'm not a babe or a chick, I'm a breasted person"
In some climes, today is National Grammar Day and vital information is given here. The Australian newspaper has been good for a stir lately about the English curriculum and has provoked some narrow one-eyed views or so they seem to my commonsense approach. 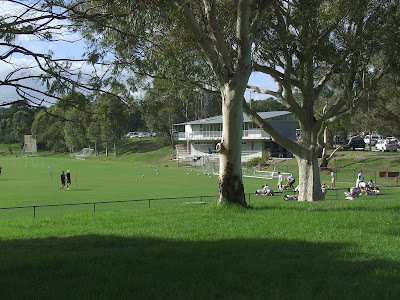 This is where The Jets (Newcastle United Jets Football Club) are training and preparing for a rumble. Soon they will compete in the Asian football championships. Good luck! Three jet-fighter planes are on their logo. What about the other Jets from West Side Story? Bernstein's music is wild and musicals are never the same again. 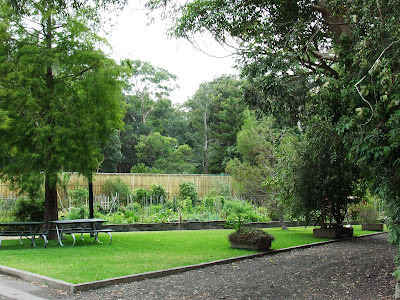 The Ray Watt Pavilion (see The Forum) is verdant after the recent rains. 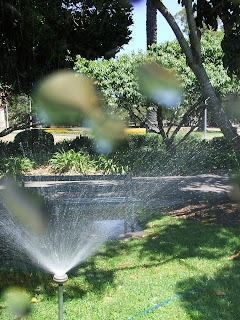 Overnight the lawns change from brown to green and the mosquitoes arrive in droves. 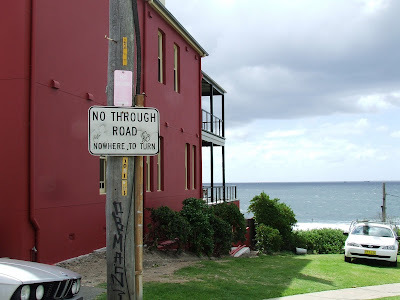 "Nowhere to turn" a specific street sign!